Who We Are In 1983, Animal was founded with the birth of Animal Pak, the venerable training “pack” that started it all. Born from the real needs and desires of professional bodybuilders, Animal has grown prodigiously over the decades. Today, as yesterday, the name Animal stands for trust, integrity and a unique no nonsense approach to the game. Animal also represents a group of products that have stood the test of time, proven again and again in the labs, and in the trenches where it counts most… The gym and the stage. Dedicated to serious nutrition for the serious athlete, Animal is your choice when it comes to complete comprehensive nutrition. Animal. The choice of champions. 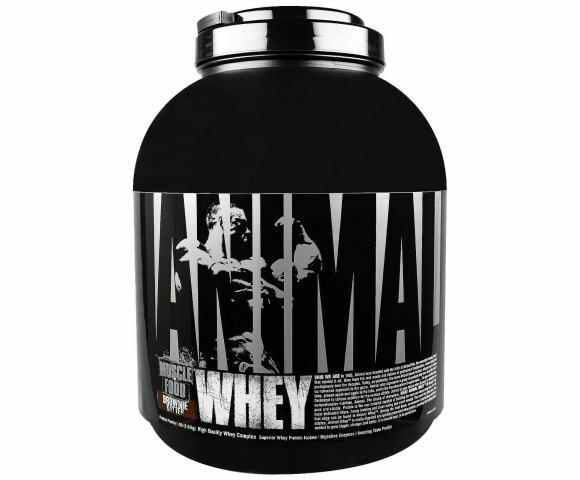 What Animal Whey Is Muscle food, pure and simple. Protein is the raw material capable of building the mass you desperately seek. For the most dedicated lifters, heavy training and clean eating just aren’t enough. They need that little extra. And that edge can be found in Animal Whey. Among the most basic, no-nonsense bodybuilding nutritional staples. Animal Whey is easily digested and quickly processed whey protein, providing the building blocks needed to grow bigger, stronger and better. It is muscle food, in its purest form. Белковая смесь из сывороточного протеина из белков (фильтрованный сывороточный протеин с поперечным потоком, ультрафильтрованный сывороточный белковый концентрат (молоко)], какао, натуральные и искусственные ароматизаторы бурого пирога, кусочки печенья [сахар, пшеничная мука, какао (обработано щелочью), частично гидрогенизированный овощ масло (соя и / или хлопковое семя)], целлюлозная камедь, ксантановая камедь, каррагенан, лецитин (соя), хлорид натрия, ацесульфам калия, сукралоза, смесь фермента пищеварительной ферментации животных (папаин, бромелайн). Сделано в помещении GMP на оборудовании, которое обрабатывает молоко, сою, яйцо, арахис, орехи деревьев, рыбу, моллюсков и пшеницу. This product is not for use by any individual under the age of 18. Please consult with a physician before using this product. Do not take this product if you have or are at a risk for any medical condition or disease including but not limited to diabetes, asthma, depression, recurrent headaches, glaucoma, difficulty urinating, prostate enlargement, seizure disorder, high blood pressure, high cholesterol, arthritis, heart disease, stroke, are pregnant, or are suffering from any inflammatory diseases. Be sure to talk to your physician before using this product if you are using any prescription drug, over-the-counter medication, or supplements. Not for use by children, patients, pregnant or nursing women. Immediately discontinue use and consult your healthcare professional if dizziness, sleeplessness, tremors, nervousness, agitation, headache, heart palpitations, or any other side effects occur. Discontinue use two weeks prior to surgery. The use of this product may be banned by some athletic associations. Athletes should consult with their sanctioning authority before use. California Residents Proposition 65 Warning: This product contains a substance known to the State of California to cause birth defects or other reproductive harm. Exercise good judgment and keep this out of reach of children. Store this product in a cool, dry place, away from heat, moisture and sunlight. Do not exceed recommended dose. * Процент дневной нормы, основанный на диете 2000 калорий. Ваши дневные значения могут быть выше или ниже в зависимости от ваших потребностей в калориях. Граммы аминокислот на порцию сыворотки животных. Аминокислоты в этом продукте встречаются, естественно, из источника белка.